It doesn’t matter whether you have a small or big space to redecorate your home, the most important thing is you should think out of the box and let your imagination run wild as this is when you will get the best ideas. 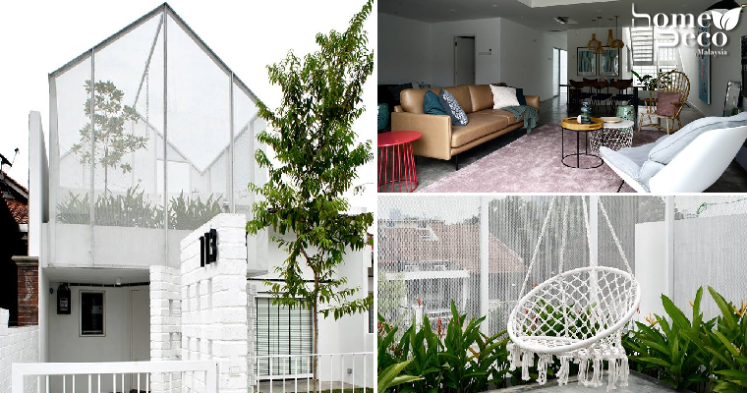 This is exactly what Paperspace, a Malaysian interior design studio did and they transformed this old, single-storey terrace house in Taman Tun Dr Ismail (TTDI) into something that is so awesome, you won’t believe how stylish it looks. Their new prototype is known as IKON 113, and this concept focuses on the humans living inside the home to ensure that they are truly cosy. However, this is not a triumph of design over comfort as you will find that it is equipped with all the modern conveniences which won’t leave you wanting. Malaysian homes typically have their car porches in front but for this chic home, the porch is hidden at the back so that it won’t distract from the beauty of the design. Although this house may only have a single storey, Paperspace has designed it look spacious and airy thanks to its high ceilings and by creating pockets of open spaces that allow the natural light and air to enter. This gorgeous house is also environmental-friendly and great for nature lovers as it incorporates lots of greenery inside the home. The conservatory at the front which represents the commitment to green living and is definitely one of the first things that you will see before you enter the stylish interior. It is also a great spot for all your OOTDs, seeing as it’s open air and there’s a pretty swing there for you to lounge about when the weather is good. While IKON 113 uses a predominantly white background for its decor, the monotony of it is broken up by lots of pastel accents and bright colours splashed around the home. Paperspace mixes elements of modernity with vintage for a fun, informal atmosphere that makes the house warm and welcoming. All images are taken from Paperspace’s Facebook page unless otherwise stated.